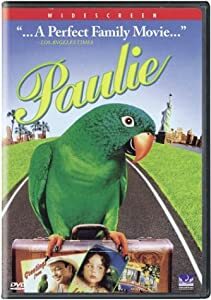 “Paulie” is a timeless movie about the journey of a Blue Crowned Conure. Paulie has an extensive vocabulary and is loved by a little girl. When Paulie is taken away from the little girl, Paulie’s life changes, and not always for the better. The movie came out in 1998 and stars Gena Rowlands. This movie is a must see for parrot lovers and is a classic family movie. Paulie is my Sun Conure Goldie’s favorite movie as it does have scenes with Conures dancing. Several themes that deal with parrots in the movie are worth remembering. One is that parrots should not just be left in a cage with little or no interaction. They are social intelligent, creatures that need to play, get exercise, and receive attention. Paulie in the movie is left in a cage for part of the movie. In addition, parrots become very attached to people. They develop strong bonds with those that they love. Paulie in the movie is especially attached to the little girl that first cared for him. Another principle in the movie concerning parrots is that they remember things very well. Paulie throughout his life and journey in the movie never forgot the little girl that first cared for him. Finally the fact that parrots do live a long time is another focus of the movie. Blue Crown Conures for instance can live up to 30 years and Sun Conures can have a similar life span. In the movie, the little girl that first cared for Paulie grows up, and Paulie almost doesn’t recognize her, as the movie spans many years. Once in a while Goldie’s owner pulls out this classic DVD and it remains a touching and thought provoking movie to this day. While Sun Conures and Blue Crown Conures don’t really talk like Paulie does in the movie, they do love, remember, and live life often in ways similar to Paulie’s.